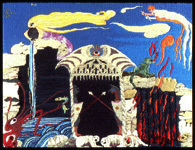 I know there are many mythical, philosophical, and political interpretations of Mozart's "The Magic Flute," but what fascinated me most from the first time I heard it was its fairytale quality: its romantic sentiment, its combination of real and imaginary creatures, its mysterious quests and trials, its lighthearted magic, its dreamlike settings. 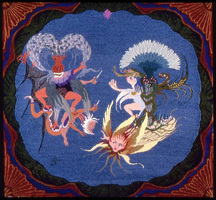 Even before I had the opportunity to attend an actual performance, my mind was already full of vivid illustrations of the magical tale’s events and characters. 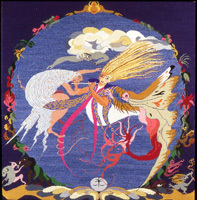 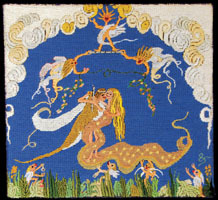 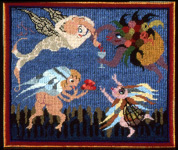 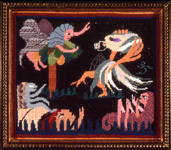 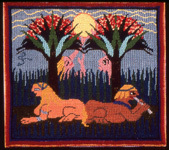 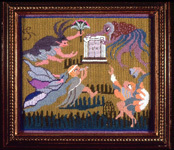 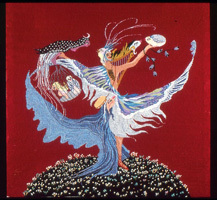 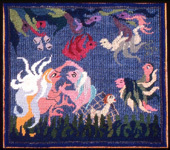 So, almost as soon as I began creating my needlepoint tapestries, I was drawn to attempting a series of pieces based on Mozart's colorful opera. 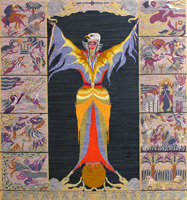 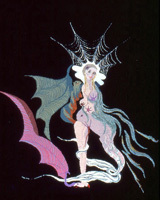 I began with Papageno, and went on to Tamino, Sarastro, the Queen of the Night, and finally Papagena who is being given a knife by the Queen of the Night to kill Sarastro, the six central tapestries of the series, which eventually included nearly a dozen more smaller works. 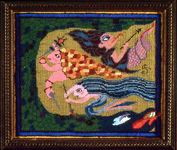 —P.C.